Is Yoga Hindu? Answer is Yes. More appropriately, it is Indic, for the idea was also developed, over centuries, by Buddhists, Jains, and a whole bunch of people who lived in the subcontinent of India. The people of this land were called Hindu by ancient Persians, and Indians by ancient Greeks, as they lived in the land across the river Sindhu known as Hind in Persia and India in Greece. The British called this subcontinent the Indian subcontinent, and the Americans call it South Asia. In the Puranas, this land is called Jambudvipa, the land of the jambul (Indian blackberry) or jambu (rose apple) tree. Today, this land includes the nation-states of India, Pakistan, Nepal, Sri Lanka and Bangladesh. India has become a political term, while Indic is a cultural term. Hindu, once a geographical term, has now become a religious term. Depending on how good a lawyer you are, you can argue that Hinduism is a religion created by the British in the 19th century, or a way of looking at the world that emerged 5,000 years ago. In America, this question of whether yoga is Hindu has been raised because of politics and economics. For some Hindus argue that the term has been appropriated by the Americans, and made commercial, hence corrupt, stripped of its spiritual significance. Others argue that it never belonged to Hindus and so the question of appropriation does not arise. Essentially, it has become a territorial fight about is it “yours” or is it “mine”, the very mental knots that yoga seeks to unravel. But there is no doubt that the idea originated in this part of the world, nurtured by many people, over hundreds of years. The form that we know it in today is the result of the re-packaging that yoga saw in the early 20th century, done in India, by Hindus. The Indus Valley seals show a man seated in a posture that yoga identifies as bhadrasana, or the throne position. Was this yoga? We can speculate either way. The Vedic traditions, that are 4,000 years old refer to the word yoga in the sense of yoking or harnessing an ox to a cart. Even today, yoga or its colloquial form “jog” is used to indicate alignment of various forces, for example, the planetary forces in astrology. One can argue that the word “jugaad” comes from “jogi” or the resourceful man who can create “jog” where none existed before. So the word has Vedic roots. The Shramana, or hermit, traditions, that are 3000 years old, brought forth many ideas that were eventually seen as yogic, such as psychological discipline – focussing (dhyan) and building awareness or perspective (dharana), or withdrawing (pratyahara), and a host of breathing exercises (pranayama) to regulate the mind and physical contortions (asana), such as standing on one foot, or holding arms aloft, favoured by hermits known as tapasvins, who do tapasya, or the churning of the spiritual fire known as tapa, which grants humans supernatural physical and psychological powers (siddhi) that enables them to control nature. So the practices associated with yoga today do have roots in the Shramana tradition. Buddhism and Jainism are Shramana traditions. In the Puranic age, that is 2000 years old, Vedic rituals and eventually Shramana traditions, were overshadowed by the stories of God, manifesting as Shiva, Vishnu and Devi. 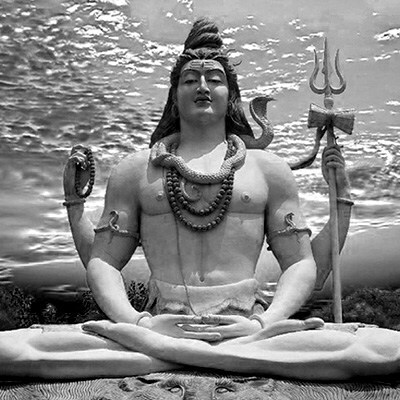 Shiva became the God who reveals Yoga to his student Patanjali, a serpent, who, in turn, shares it with the world. Vishnu also shares it, as Krishna to Arjuna, and Ram to Hanuman. Here, we start seeing a division. Some focus more on the psychological aspect, ideas such as union of the individual soul (jiva-atma) with the cosmic soul (para-atma) that is God, which is known as samadhi. Others focus on the physical aspects, especially magical powers related to celibacy, which is known as siddhi. The samadhi focus is seen as Vedic and the siddhi focus as Tantrik, though such divisions are arbitrary. The focus varies in various texts. In Bhagavad Gita, which is part of the Mahabharata, for example, there is a reference to the psychological aspect of yoga, and to pranayama, but not to asanas, while in Patanjali’s yoga sutra, the reference to asanas is minimal, it does lend a clear definition of yoga (removal of mental twists and turns), and feels no obligation to be overly theistic, except functionally. In the Nath traditions, that started becoming increasingly popular 1,000 years ago, there are clear references to the physical aspect of yoga: various yogic postures and breathing exercises. These are used by ash-smeared mendicants who revere Matsyendra-nath and Gorakh-nath. The more radical members of this school of thought are the naked ascetics that fascinate the West, and satisfy their craving for the exotic. Since the 19th century, during the British rule, to counter the European discourse, and following exposure to European style gymnastics, under the patronage of Wodeyar kings of Mysore, local gurus of traditional physical culture such as Krishnamacharya conceptualised and organised yoga as we know it today, and it spread across India and around the world through teachers such as Iyengar and Sivananda. There have been translations and commentaries on ancient and medieval yoga texts such as Patanjali’s yoga sutra by scholars and academicians, including Vivekananda. Today, the idea and practice of yoga has spread widely across the world, alarming on one the hand Christian and Muslim isolationists and supremacists (who see this as covert Hindu missionary activity) and Hindu isolationists and supremacists (who fear the appropriation of their faith and culture). Then there are the atheists and secularists, also seeking supremacy, who see red every time the word tradition or religion is mentioned. We must be careful of arguments presented by Right wing and Left wing thinkers, who are both outliers in all cultures, but tend to dominate discourse and take away nuance. The Right wing, especially the Hindu supremacists among them, tend to believe that yoga emerged in its perfect pristine form within Hinduism somewhere in the distant past, even before the Indus Valley civilisation. The Left wing has contempt for all things ancient, religious or tradiitonal. These two wings feed off each other as they spend all their time arguing against each other’s ideas, rather than appreciating that history is neither simple nor linear. To deny that yoga has no special relationship with India, with Hinduism, Buddhism and Jainism, is like saying America has nothing to do with Native Americans (except being built on their corpses). At the same time, to accuse the West of stealing yoga is unfair, and ideas do transform following cultural exchange. The idea of “purity” that many religious and academic folk cling to is dangerous as it ultimately ends up establishing “untouchability”.